As the new product project advances through the structured NPD Process, financial forecasts are an important metric that gatekeepers will review and scrutinize. Again, profitability is the goal of all companies and new product development efforts are an effective path to achieving revenue growth. Note that the purpose of the forecast, and the subsequent managerial analysis, will change with each stage (3). Perhaps the most critical forecast for the new product development effort occurs during Stage 3, after the Fuzzy Front End work is completed and large investments are committed in the Technical and Commercial Development Stages. Kahn (3) describes the Jury of Executive Opinion as a top-down forecasting technique that arrives at a sales expectation by largely ad‑hoc, “gut-feel” methodologies. Experts in Sales and Marketing functions from the business line will often meet face-to-face or virtually and hammer out a sales forecast for the new product by sharing combined expert opinions, predictions, and other information. The forecast is then broken down into increasingly smaller units by geography, region, and/or individual salesperson for reporting and accountability. Scenario Planning, or “What-If” Analysis, often is a key discussion held by these experts. With scenario planning, the project team can develop indicators so that the company can plan and respond to emerging situations before the competition (6). For example, in a line extension project, the jury of executives may dialogue about a specific scenario in which the project is delayed for a period of time, the competition introduces their new product first, and sales would be negatively impacted by 25% in North America. Another widely used tool is Historical Trend Analysis. Here we assume that past performance is indeed an indicator of future sales. Basic Diffusion Models estimate the ratio of cumulative sales as a function of sales and time, whereas simpler trend models look at sales vs. time alone (7). Rao has found that simple extrapolations of trends give the best fit across new products in the consumer durable goods markets (e.g. dishwashers and televisions) (7). where ECV is the Expected Commercial Value, PV is the Net Present Value of the project’s future earnings, PCS is the probability of commercial success, C is the cost of launch, PTS is the probability of technical success, and D is the remaining development cost for the project. Existing sales information is derived from internal records, from order-to-pay cycle analysis, the sales information system, data warehouses, supplier inventory systems, and marketing intelligence systems (10). Particularly important in NPD are the micro-sales analyses. That is, looking at specific products, technologies, or regions that failed to produce the expected sales. Accounting techniques, such as Variance Analysis (11), may be useful in Historical Trend Analysis, especially in root cause determination to extend learnings to the current NPD effort. Knowing the overall market size (3 million potential units in the example shown here), we estimate the awareness of our new product (40% in the example) and the number of consumers willing to try it (20%), and calculate the potential market as 240,000 units. 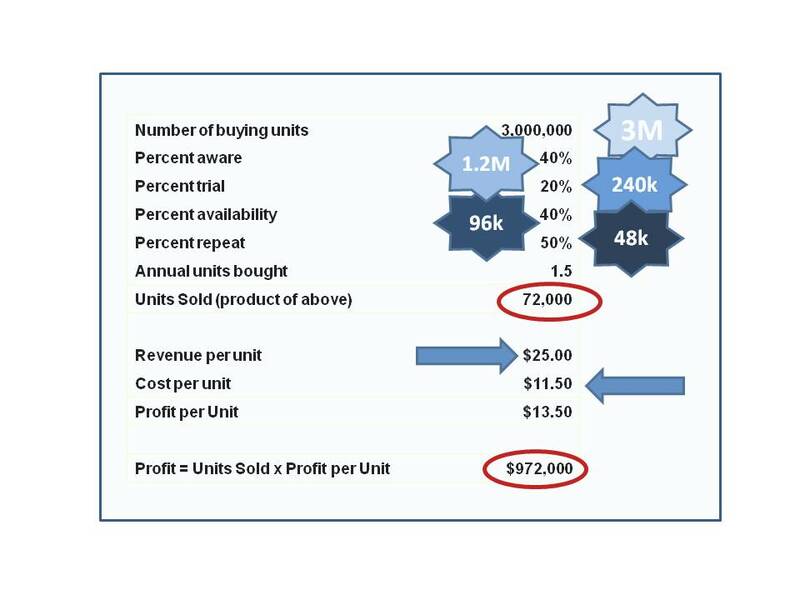 If our new product is only available to 40% of those potential customers due to distribution limitations, for instance, and each customer will buy three units every two years, our annual unit sales estimate by the ATAR method is thus 72,000 units per year. Finally, knowing our profit per unit is $13.50, we estimate a profitable return of $972,000 for this new product. ATAR is most commonly used for consumer packaged goods. The model is generally not as useful for consumer durable goods, since the trial and repeat purchases are not normally part of the average buying experience. New Product Forecasting is a difficult but important task to determine project success. Early in the NPD effort, the team must prepare a simple business case, including customer needs, product ideas, strategic fit, and rough forecasts of sales and profitability. After all, companies are in business to make money! Many other predictive models are described in the literature; however, with the lack of full definition of the product, especially in the Fuzzy Front End, simple methods (7) are often more useful, and more accurate, than complicated ones.